Welcome to our tribute gallery. Please browse through some of the unique pieces that were requested by our customers. 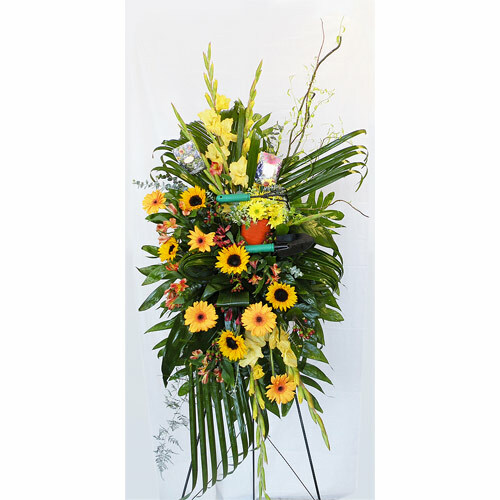 In each instance, we tried our best to understand the request and apply our design skills to come up with not just a sympathy decoration, but a tribute to the person they are honoring. Some of these designs were not properly lighted nor staged for display, but we wanted to capture our design for future reference as an example of our quality workmanship. Please browse the Sympathy category for additional selection. Click on the picture to enlarge the image. Once enlarged, you can easily view the rest of the pictures in the enlarged format by rolling the mouse over the right or left side of image and clicking to move next/previous through the pictures. Alternatively, you can press the right/left arrow key. Press Esc key to exit at any time.